Today I'm sharing with you all this superrr colorful and tasty quinoa tabbouleh summer salad recipe. Although it's not officially summer yet until June 21st... we can all agree that the days are getting longer, and warmer, and well, it's starting to feel a lotttt like summer. And summer calls for light, colorful, refreshing food - like salads! Except here's the irony of it all. I'm currently in the Pacific North West, where it does NOT feel like summer, at all. Maybe 55 degree mornings are summer here in June, but nottt for this Miami gal. haha. I'm enjoying a few days on the west coast with my other half, exploring all of central Oregon, but I'm taking a minute off of the hiking to post this tasty summery salad, because maybe where-ever-you-are the weather feels like summertime for you. In the meantime, I'm skipping the salad until I'm back home in sunny (and warm) south Florida, 😛 but please don't let that deter you from trying this yummy yummayy salad. It's chock full of fresh veggies - tomatoes, cucumbers, red onions, cilantro, mixed greens! Sooo easy to put together especially if you're using left over quinoa from a previous meal. Chop, throw, and mix. Chop your veggies, throw them all in a bowl, and mix it up. Refined oil free, yet still full of flavor. You don't need oil to make food taste good, I promise. It's got MANGOES! And who does not love mangoes in their summer salads? It's almost a must in my book. Chickpeas for added protein and some nice chew. You can even go a step further and roast your chickpeas for an added crunch if that's your thing. Goes insanely well paired up with my last blog post - the oil free golden turmeric salad dressing I've been hooked on lately. However if you're more of a cilantro fan - you have to try it with this oil free creamy cilantro garlic sauce - so good! But if all else fails, just add some lime juice on top. If the word tabbouleh is not familiar to you, (it was definitely not familiar to me..), it might sound like this is a very exotic and therefore difficult dish to prepare. However, I promise you it's not, difficult I mean. Tabbouleh is a traditional Arabian dish which usually compromises of cracked wheat with finely chopped vegetables (usually tomatoes, parsley, and onions) and is almost always served cold. The preparation of this dish is real easy - gather your chopped veggies and mix them in with some pre-cooked quinoa. You can also use couscous or bulgur if you want to try something different. After you've mixed everything up, you can place it in the fridge for a few hours to let it chill. Honestly, I'm always way to hungry to wait, and I enjoy mines at room temperature just fine. You can serve the tabbouleh on a bed of fresh mixed greens (what you see in the pictures is a base of arugula) or just eat it as is with a spoon, fork or some crackers on the side. Don't forget to take it up another level by drizzling some of this oil free golden turmeric salad dressing goodness on top, or just add lemon or lime. The inspiration for this summery salad came from Dr. Michael Greger's latest book - The How Not To Die CookBook (affiliate link). If you've been following this blog for a while, then you already know that I am a BIG big fan of Dr. Greger's work. If you haven't checked out his books yet - you are missing out on some good good plant based science-based information! I highly recommend both the How Not To Die Book (affiliate link), and the latest cook book as well. Want to see more summer eats? Check out this vegan papaya ice cream or these colorful vegan loaded nachos that scream summer! 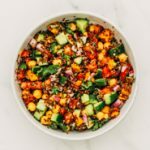 A delicious tropical Vegan Quinoa Tabbouleh Summer Salad Recipe that is loaded with hearty fresh veggies. Oil free golden turmeric salad dressing (or if you like cilantro – you can try this oil free cilantro garlic sauce) drizzled on top or if you’re a hurry just throw some lime juice on top, it’s really tasty this way too! Add 2 cups of cooked quinoa to a mixing bowl (for best result let quinoa cool down a bit if still warm before mixing veggies in). Add the garbanzo beans, chopped mangoes if using, and the mixed chopped vegetables (except the optional mixed greens), to the mixing bowl and gently fold in, mixing it all in with the quinoa. Add the pinch of salt and black pepper to taste. Tabbouleh is traditionally served cold, so you can go ahead and place the mixing bowl in the fridge for a few hours if you want it cold… or you can serve right away at room temperature. Both ways are great in my opinion! 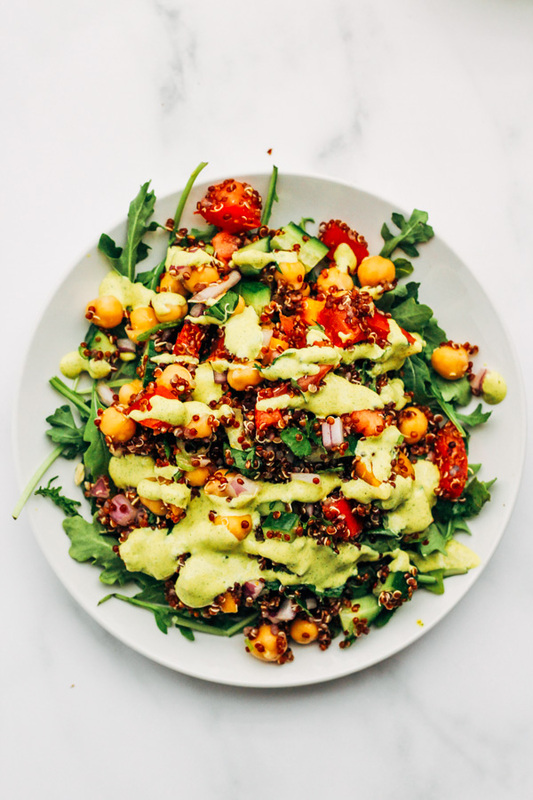 When ready to serve – serve tabbouleh on top of mixed greens and drizzle some oil free golden turmeric salad dressing or this yummy oil free cilantro garlic sauce. You can also skip the dressings and just throw lime juice on top for a quicker alternative. 😉 Enjoy! I used a mix of red and white quinoa – but honestly I prefer using white quinoa only with this recipe. This is a great salad to clean out the fridge with – find whatever scraps or extra veggies you have laying around in the fridge that are about to spoil and use them up in this salad! If you don’t have the extra time to make the oil free golden turmeric salad dressing, feel free to use any salad dressing that you have on hand, or you can use the juice of a lime as well for added flavor! This salad is best enjoyed fresh and the day of, but left overs will last for about a day or two.